FORTUNE -- It's all too easy to talk about the struggles of America's cities and, in particular, of residents of our inner cities, but how do you actually address these issues? Proposed solutions have ranged from the compassionate to the patronizing, the caustic, and absurd. 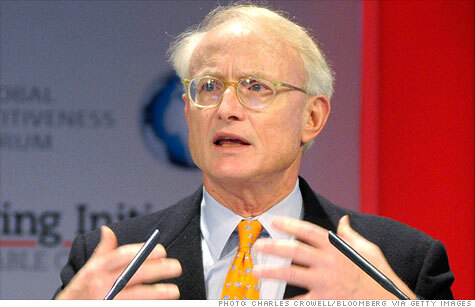 Harvard Business School professor Michael Porter has advocated an approach that focuses on job training and business development as a means to counter inner city poverty and blight. Largely considered one of the foremost authorities on economic development and regional economic competitiveness, Porter is also the founder of the Initiative for a Competitive Inner City, a nonprofit research organization devoted to the economic health of America's inner cities. Fortune spoke with Professor Porter to get his perspective on what it will take to build robust inner city economies in the years to come. Here is an edited transcript of the interview. Fortune: What kind of a shift in attitudes about inner city economic issues have you seen since launching the Initiative for a Competitive Inner City? Michael Porter: In 1994, I think there was a complete lack of recognition that business and business development had anything to do with the problems of urban poverty. The discussion was riveted on education, childcare, drugs, and teen pregnancy, and a whole host of social issues. Today, there is recognition that small business growth in these communities is a long-term solution to equality. If you talk to government agencies or the White House, I think that we made huge strides in defining the problem to include business. The out-of-work inner city resident is an all too common stereotype. What's the job situation actually like, and how has it changed since you launched ICIC? In those days [the 1990s], labor markets were fairly tight and companies were struggling to recruit workers. We discovered early on that most inner city residents have a job but they are working in a job that does not require much skill. There was an opportunity to "up-job" if we could get this business cycle going. We've had two complicating developments. One is that we have a lot of people unemployed all over the economy. The scarcity [of available workers] is no longer an asset that inner cities have. The second is the "up-skill-ing" of work, for more and more jobs one needs some level of advanced training and problem solving skills. So in a sense the bar has been raised that tends to disadvantage inner cities. Is there any upside to these challenges? I think there's been a widespread recognition of [consumer] demand. Many retailers have reentered [the cities]. That has been a positive tailwind. Another tailwind recently has been the growing recognition that logistics is expensive, that moving stuff around costs a lot of money in terms of carbon emissions. All of the sudden, the inner city's logistical efficiency has become more valuable. And that has partly offset the one final trend, which is the globalization trend, which is then of course an adverse trend as more and more stuff becomes outsourced. We see many American companies bringing stuff back to the U.S.; things that involve heavy logistics. What goes into building the kind of inner city economies that you are advocating for? We have to continue to mount a skills agenda, which will build the managerial capacity and better allow the companies and residents of the communities to grow and develop. Literally knowing other companies and having access to government contracts is hugely important. A lot of groups are focused on inner city minority groups. The central focus of our work should be to assist people who are economically underperforming, helping those folks get access to the market economy rather than women or minorities per se. Helping a women-owned business in the suburbs is great, but it's going to have minimal impact on inner city business. We've always believed that to deal with this problem of getting residents into the workforce, proximity does matter, having jobs available in or near communities in which the underserved communities live. As more and more Americans are moving into cities, aren't more of the "good jobs" in cities going to the wealthier people who are moving in? What we find is that the great majority of the residents of inner cities are largely the same as they were a decade ago because we define inner city on the basis of economic performance. The change in the inner cities themselves is the large influx of immigrants who often perform better. The fact that they showed up here, they are entrepreneurial people; they are willing to take risks. The immigrant groups have done well relative to the others. That said, we find that small business development creates all kinds of jobs with all kinds of skill levels. There's a vast percentage of jobs in the economy that do not require high levels of formal education. They often require levels of training or skill development, whether it's hospital services, food services, or building maintenance. I don't think that this re-urbanization is just creating IT jobs or people that write software. It is a vast array of jobs that are being created. Another thing about economic development and how people advance, some people start at the top; they went to Harvard and are on their way. But a lot of people work their way up. What's your take on the government's performance when it comes to job creation and training? And how have priorities changed? I think the story is very mixed in America. The public investment we make in training is going down. More of the money has been invested in job placement services and less of the money is going into actual training. Our training system, which is partly funded by the federal government but administered at the state and local level, has been less than ideal in terms of providing training for the occupations the economy really needs. You have these community colleges where it's a business for them rather than having the training system closely connected to the demand for the jobs. What would be an example of an ideal training program, then? In an economy, there are these clumps of businesses that reinforce each other. It's not just one industry; it's a whole cluster of related businesses. We find that the best training efforts are cluster-related, where an industry group creates training programs that are conduits to their field. A very common example: there are often hospitality schools that are sometimes jointly run by hotels. When you can build training around a particular cluster and there's a direct connection that gets you right into the workforce; that works well. Financial incentives are the bread and butter for local government-supported economic development groups to entice companies to locate in their area. Is there any indication that these programs actually help city economies? Economic empowerment zones, incentives -- not much evidence that those make a difference. That's because it's much easier to say "we'll give you a cash break" than actually fixing the problem. It's the fundamentals that are important: whether there's decent infrastructure, whether you're in a good location. But giving someone a financial incentive, that doesn't override the fundamentals. Revenue is the oxygen of business. Without revenue, nothing happens.